At the Sharp End: Uncovering the Work of Five Leading Dramatists: David Edgar, Tim Etchells, David Greig, Tanika Gupta, Mark Ravenhill. By Peter Billingham. London: Methuen, 2007. Pp. 264. £16.99/$15.95 Pb. 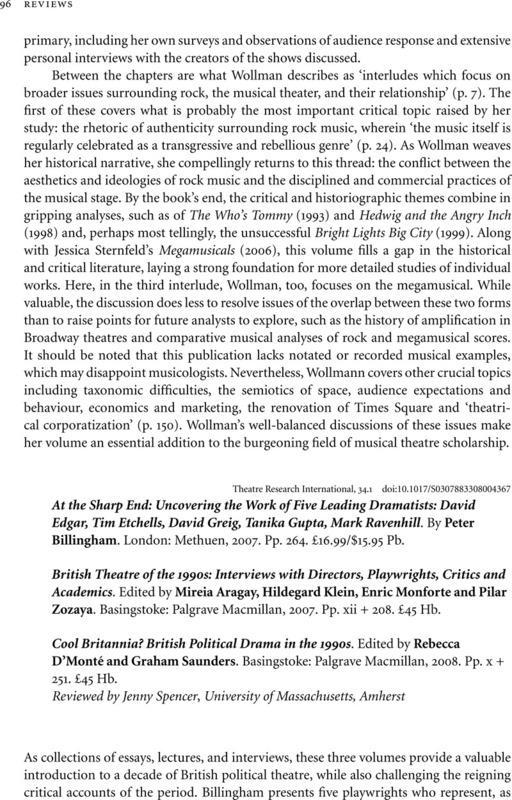 - British Theatre of the 1990s: Interviews with Directors, Playwrights, Critics and Academics. Edited by Mireia Aragay, Hildegard Klein, Enric Monforte and Pilar Zozaya. Basingstoke: Palgrave Macmillan, 2007. Pp. xii + 208. £45 Hb. - Cool Britannia? British Political Drama in the 1990s. Edited by Rebecca D'Monté and Graham Saunders. Basingstoke: Palgrave Macmillan, 2008. Pp. x + 251. £45 Hb.